“Nothing . . . Everything!” This is how Fantomas, the first true super-villain of the pulps, is described. First published in 1911, Fantomas, written by the team of Pierre Souvestre and Marcel Allain, quickly became a cause célèbre in France. The surrealists, especially the poet Robert Desnos and the painter Rene Magritte, loved Fantomas more than most, as the black-clad arch-criminal frequently performed gruesome acts of murder and mutilation, all the while laughing at the bourgeoisie of Paris and the Third Republic. 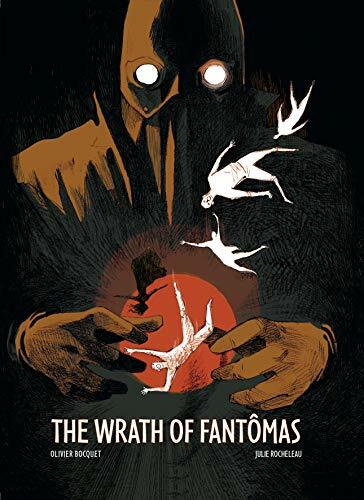 Wrath of Fantomas, a lush graphic novel penned by the French duo of writer Olivier Bocquet and artist Julie Rocheleau, is a loving, yet ultraviolent homage to the first Fantomas novel. Composed in gorgeous slashes of reds, greens, oranges, and dark blues, The Wrath of Fantomas is a true feast for the eyes. Rocheleau, who makes her professional comics debut in this title, excels at juxtaposing the beauty of Belle Epoque Paris with the absolute horror of Fantomas’s crimes. In one unforgettable scene, Fantomas uses an everyday meat skewer to impale the brains of a certain Madame Flanquet. Mind you, this murder happens while Fantomas is in court and on trial for murder. Decapitated heads, bombs, machine guns, and trained rats abound in this graphic thriller. Bocquet does such a great job of translating Allain and Souvestre’s words to the comics medium that it is easy to forget that this is not a completely original piece of literature. Bocquet and Rocheleau’s make two changes to the original novel by adding titans from the early days of French cinema—directors Louis Feuillade and Georges Melies. In real life, Feuillade directed several Fantomas serials starring actor Rene Navarre as the titular villain. Therefore, Bocquet’s inclusion of him in The Wrath of Fantomas is especially poignant. This graphic novel would serve admirably as an introduction to the world of the “Genius of Crime.” Fantomas came before both The Shadow and Batman, and his malicious fingertips are all over the “Golden Age” of comics. Wrath of Fantomas proves that a character created all the way back in 1911 has more relevance today than characters created in the 1990s or early 2000s. Fantomas is and remains an obsidian anti-hero—a terrorist by any measurable standard who uses the netherworld of Parisian criminals in order to mock the established order time and time again. Despite the age of its source material, Wrath of Fantomas is the type of cutting-edge, yet charming crime story that today’s adult comics readers desire. Bocquet and Rocheleau have made a knockout punch of a graphic novel, and do not be surprised if there are more Fantomas comics on the way.